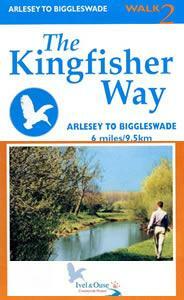 Kingfisher Way Walk -Arlesey-Biggleswade at Arlesey Walking RouteThe Kingfisher Way has been developed to make use of the Ivel Valley's railway stations, allowing the route to be tackled as a whole or in stages. This section, from Arlesey to Biggleswade, provides a perfect introduction to the countryside and wildlife of the valley and passes by Langford Meadows nature reserve, and Holme Mills, the last commercial mill operating on the river today. End Point: Franklin's Mill, Biggleswade. The Kingfisher Way has been developed to make use of the Ivel Valley's railway stations, allowing the route to be tackled as a whole or in stages. This section, from Arlesey to Biggleswade, provides a perfect introduction to the countryside and wildlife of the valley and passes by Langford Meadows nature reserve, and Holme Mills, the last commercial mill operating on the river today. How to get there by car/parking: Arlesey is situated off the A507, about 2 miles north of Letchworth.Car parking is available at Biggleswade and Arlesey stations. If you park in the station there is a fee to pay.